We got a double dose of UK rock at the Bowery on March 27th. 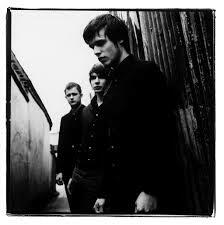 After The Friendly Fires shimmied their asses off they made way for the second band, The White Lies. While we went to the basement bar of the Bowery to say hello to Jim Beam, The White Lies were busy changing into all black outfits and placing serious white spotlights on stage. When they came out they immediately reminded me of 'Sprockets' - that old Mike Meyers SNL bit making fun of the weirdness of Germans - it worked for them though. They sound like Joy Division meets The Killers and with a beautiful lead singer that has piercing eyes and sings like he still has that youthful resentment and anger, I can see why the UK really likes them. In fact I think most of the audience were POMS (Property of the Monarchy). I mean they ended the concert with 'Death', their hit single; the Brits love a good self-deprecating statement.